"Inducing Stem Cell Myogenesis Using NanoScript"
In the 1990s, scientists first isolated human embryonic stem cells, which can turn into any kind of cell in the body, and the promise of a new way to treat diseases emerged. Since then, scientists have also discovered adult stem cells in a number of organs in the body, including the brain, lungs and skin, that can turn into a limited number of cell types. However, harnessing these special cells to treat disease has been difficult. One of the main obstacles has been figuring out how to control them. Ki-Bum Lee and colleagues wanted to tackle this challenge. The researchers created an artificial version of a transcription factor — a protein critical to orchestrating stem-cell differentiation — using gold nanoparticles. They added small molecules to mimic the structure and function of the natural transcription factor that induces muscle-cell growth. The synthetic proteins, called NanoScript, successfully coaxed stem cells derived from fat tissue to become muscle. The researchers say they can potentially design their NanoScript system to grow other cell types, too. The authors acknowledge funding from the National Institutes of Health, the N.J. Commission on Spinal Cord Research and the Rutgers Busch Biomedical Grant Program. 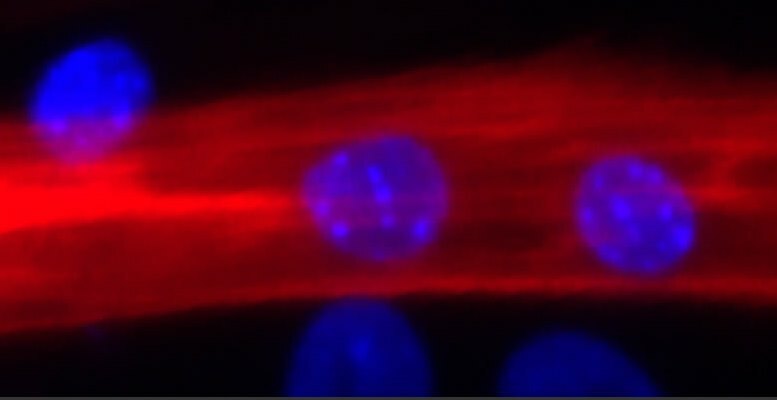 Scientists coaxed the development of this muscle cell from an adult stem cell.